The Indian influence over South-East Asia expanded a lot during the time of Pallavas between the fifth and seventh centuries and the influence was mainly seen in Cambodia. In Indonesia, Srivijaya, a maritime power and dynasty which controlled the empire stretching from Sumatra to Malaya, Thailand, Cambodia and Vietnam arose from obscurity in the 8th century. Srivijaya was an Indianised polity, more Buddhist than Brahminical with its capital near Palembang in South Eastern Sumatra. Rival to the Srivijaya dynasty was the joint kingdoms of Sailendra and Sanjaya based in central Java. It was during their time (after 780 CE) that the temple building activity flourished in the island. These temples were based on the layout and elevation of the Pallavan and Chalukyan temples. An exception to this style of construction is the colossal temple at Borobudur, which apparently started as a Hindu temple and was converted to a Buddhist place of worship. 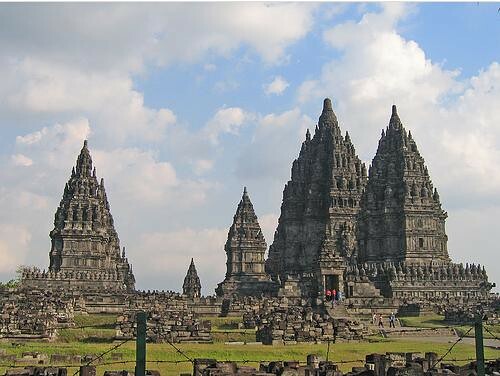 One of the largest Hindu temples in the region is Prambanan, located in central Java. This temple, which was built around 850 CE during the time of the Sanjaya dynasty is dedicated to the Trimurtis. There are about 200 temples in this complex and the bas-relief of the temple depicts the story of Ramayana. Parts of this temple was damaged in the recent earthquake that hit Indonesia. Brahma temple, one of the ancient shrines in the Prambanan compound in Klaten, Central Java,has been seriously damaged by the earthquake measuring 5.9 on the Richter scale which struck Yogyakarta city and environs early Saturday morning, a tourism official said. “In the Prambanan complex, Brahma Temple sustained serious damage in the earthquake,” Soeroso, director of archalogical heritages at the Tourism, ArtS and Culture Ministry , said here on Saturday.